Superhero — or supervillain? You decide in this buildable dice game. Your customizable dice pool is used to execute a variety of superpowers. Gain special abilities and new play experiences by taking on the role of 10 different heroes / villains. 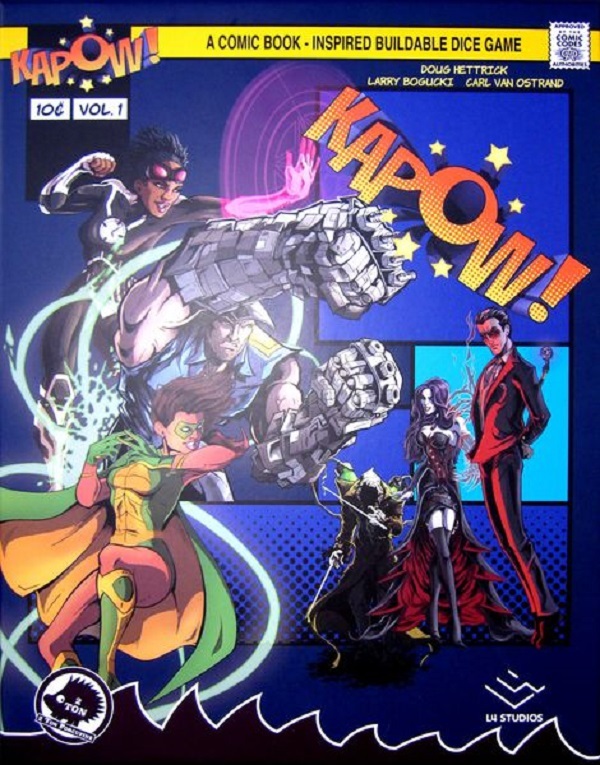 In Kapow!, players go head-to-head in a classic explosive clash of good vs. evil. Players choose to be a villain or a hero, Players must decide how to build their dice pool and how to use rolls in the most effective way possible. The fun is fast and furious — get ready to rumble in superhero style with Kapow! This is a dice-chucking game that's heavy on action AND strategy. Players start with, and can gain additional blank buildable "Action Dice." These dice have removable faces that you customize to your liking to best-enhance your character. The combination of choosing how to grow your dice pool, how to customize your Action die faces, and how to use each roll, leads to a very satisfying, strategic showdown. If you love head-to-head style play in about 30 minutes, this game will keep you coming back. Great for casual sparring or more-intense tournament play. Also contains 2 v 2 (2 heroes vs. 2 villains) and 2 v 1 (2 heroes vs. 1 mega-villain) variants!